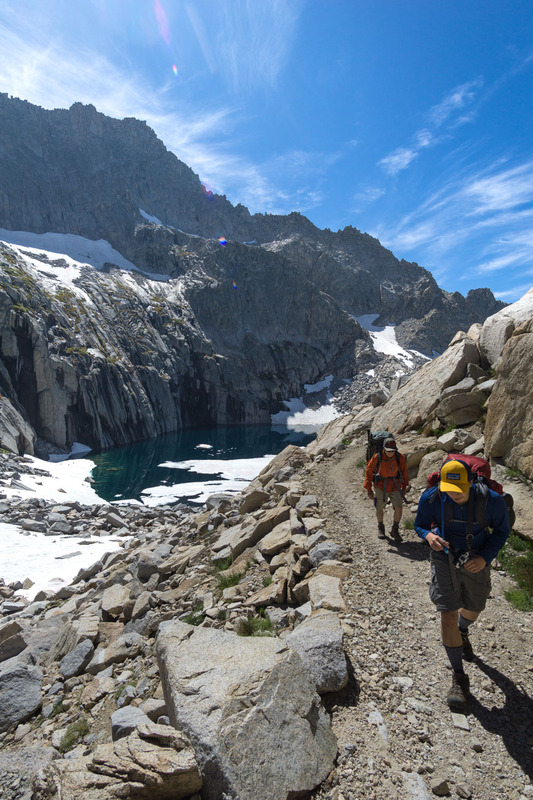 Our third day on the High Sierra Trail took us through a variety of terrains and set a couple milestones for the trip. Day 3 not only included the steepest climb of the week, it also had a lot of climbing - we grossed a total of 4,000 feet in elevation gain. This day we also got to see my favorite lake of the trip, the breathtaking Precipice Lake! Talk about a day in the mountains! When I look back at this trip, I usually think of this day, since the views and the different types of terrain we covered embodies all of the best the High Sierra has to offer. From hiking up and over a mountain pass in the Great Western Divide to pristine alpine lakes to lush meadows with wildflowers and creeks, every hour on the trail brought an entirely new set of views. We watched the sun rise up and over the sheer mountains while we made breakfast, pumped water, and packed up camp. Looking up at the trail clearly etched into the mountain side, I felt a little nervous kicking off the day with what would be the steepest section of the entire High Sierra Trail - the climb up and over Kaweah Gap. The trail crosses the creek flowing out of Hamilton Lake and starts switchbacking back and forth up the side of the cliff heading towards the north side of the lake. After about 1,000 ft of climbing and 1.4 miles in, we reached a very cool section of the hike - Hamilton Gorge! There used to be a steel suspension bridge that spanned this gorge in 1932, but a winter avalanche destroyed it in 1937. The trail now goes through a rock tunnel that was created by the Civilian Conservation Corps in 1938 and then curves around a deep cut in the mountain. On the other side of the tunnel, the trail is carved on a narrow ledge with a straight vertical drop down into the canyon below on one side that makes my hands a little sweaty just thinking about it. From there there were only a few more switchbacks spread out over the next 1.2 miles up to Precipice Lake. Our final views of Hamilton Lake disappeared behind us as we headed for the ridge up above where Precipice supposedly sat on the other side. As we stepped over the ridge, we finally got our first glimpse of Precipice Lake! I had been wanting to visit this lake in person ever since I first saw photos of it, and it did not disappoint. What a picturesque lake! This was also our first encounter with snow on this trip as we were all the way up at 10,300. The snow banks up here were large enough to cover the entire rim of the lake as well part of the trail. We had originally planned to camp here, but we swapped with Hamilton Lake instead because of the availability of bear boxes and temperatures. Being up here in the middle of the day, we were glad we made that choice since the air was quite nippy even in the sun, and we didn't spot too many snow-free campsite options. The crystal clear water with a unique emerald and blue gradient made a scenic backdrop for lunch, and I couldn't stop looking at the black stripes on the rock reflecting off the glassy water... it was hard to tell where the rocks stopped and water began. After a filling lunch of salami, cheese, and tortilla (click here for more backpacking meal ideas! ), we got back on the trail and had a little more climbing to do before the trail leveled out and meandered through a lush basin containing several smaller bodies of water. At last, only 3.4 miles from Hamilton Lake, we reached the peak of Kaweah Gap! We let out cheers and hoots as we reached the apex with the placard honoring George Stewart, the founder of Sequoia National Park. After gaining a total net elevation of 4,000 feet since day one, we were standing on top of the Great Western Divide! I really couldn't believe that we were about to step food over the mountains that seemed so dauntingly tall and far the past two days. We took some packs-off time to soak in the idea of what we just accomplished, as well as the views. It was so cool to be able to see both the barren, alpine basin with patches of snow on one side of the ridge at the same time as the lush forests and meadows on the other side. As soon as we crossed over the ridge and into the valley on the other side, the terrain changed completely. I felt like I was tromping through an idyllic garden at times. There were wildflowers and mini waterfalls from the creek flowing through the middle of the valley, and we even heard a pack of coyotes nearby. There were several great options to camp along this part of the valley. The trail followed Big Arroyo creek downhill for 3.25 miles until we reached Big Arroyo Junction, the spot we had originally planned to camp at since there were bear boxes, and it was a good stopping point between Kaweah Gap and Moraine Lake. Our original game plan had us taking 8 days to finish the entire trail, but the multitude of bear boxes along the trail covering most of the sites really opened up the opportunity for us to be flexible when it comes to deciding where to actually camp based on how we were feeling that day. After all of the dramatic views the past 3 days, we weren't particularly excited by a calm riverside camp site at Big Arroyo, so we decided to push on since we were all feeling good. We had lost about 1,100 feet in elevation since descending from Kaweah Gap, and we were about to gain it all back by climbing back up the north valley wall. For 2.8 miles we made our way up steadily to the top of the ridge. The forested valley landscape and the east side of the Great Western Divide were bathed in the golden light of the setting sun, but we didn't have time to enjoy the views too much as we had to race the sun and get to camp. Once we reached the Chagoopa Plateau on top of the ridge, we only had 1.8 miles till we hit the Moraine Lake junction. We took the fork on the right to head to Moraine Lake, even though it would be an additional 0.8 mile detour. There aren't too many lakes in this area, so Moraine Lake seemed like the perfect way to break up the slight monotony of hiking through the flat valley for the middle of the trip. The next 2.2 miles were all downhill, but the terrain turned slightly rocky, which made it more challenging to hike at night with our headlamps. At last we stumbled into Moraine Lake where we found bear boxes and no shortage of flat soft camping spots to choose from. Delirious from the long 14 mile day and constant up and down in elevation, we didn't even bother looking for the lake in the pitch dark to pump water. The trees were quite thick and blocked out any light, but we were still able to set up our tent, scarf down some food, and take a quick baby wipe shower before we zonked out.